Korma spices and dried ginger - it's not Irish but I love spicy food and I'm always keen to try something new. I haven't seen chunks o dried ginger before so it will be interesting to try something wit it. Thank you, Anna, you made me really happy. I can only hope that Emily at Bristol Bites will enjoy the parcel that I sent. 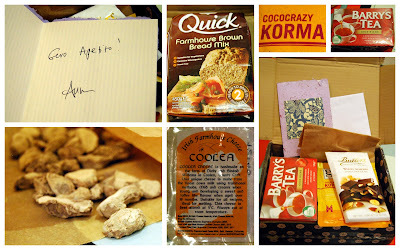 You just have to read a lot of food related blogs:) Anyway, it's really fun! That's an interesting comment, I should say. I guess not everyone notices that this blog is indeed a food blog. Having a food blog usually means we are curious about all kinds of food.